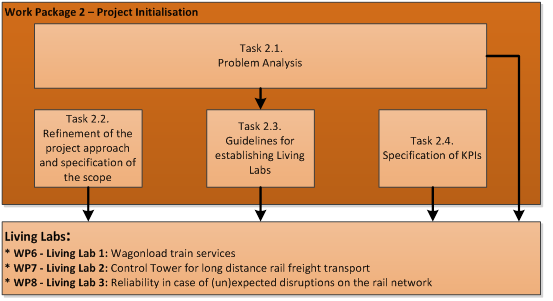 After the kick-off in May 2015, a project team was assembled of the SMART-RAIL partners Panteia, Railistics, TNO, ZLC and Abirail for the project initialisation (conducted in Work Package 2). The objective of this team was to establish a solid foundation for the following activities and to adjust the approach and corresponding workplan to the additional insights obtained in the various discussions following the start of the project. An important result of this activitiy were the initial guidelines for the different Continuous Improvement Tracks including amongst others the approach for testing and monitoring and a reference set of Key Performance Indicators (KPIs) to monitor the quality improvements. Rail related barriers were identified by the project team. This was done by means of desk research in combination with the project teams market intelligence. The project team identified a long list of relevant and existing projects, which provided the pre-identified barriers and best practices. In this project we identified four main type of barriers and four categories of solutions. General solutions for multimodal transport, Data/information related solutions, technical/logistics solutions and capacity-related solutions. For more information, see public report D2.1. A detailed work plan of all technical Work Packages is presented in public report D2.2. In this deliverable, background information of the different Work Packages is described and the solutions and stakeholders that will be taken into account. Moreover, the interrelation between all upcoming Work Packages is refined, to optimise the effectiveness of the activities. A handbook was written to guide all three Continuous Improvement Tracks in their process of implementing innovative solutions. The Continuous Improvement Track approach consists of multiple adjustment and improvement cycles. Each of the cycles usually consists of the following phases: Planning, Real life implementation, evaluation and acting. The public report D2.3 introduces the Continuous Improvement Track methodology. A general analysis of existing KPIs was performed, as input for the technical Work Packages. All KPIs will be defined in a consistent and harmonised way to avoid information leakage, hence the unified parameters and specifications for measuring KPIs will be used by all partners and stakeholders involved in SMART-RAIL. The KPIs will be fine-tuned in each individual Living Lab and monitored on a regular basis to be able to adjust and improve, as described in the Continuous Improvement Track Handbook (see public report D2.4).